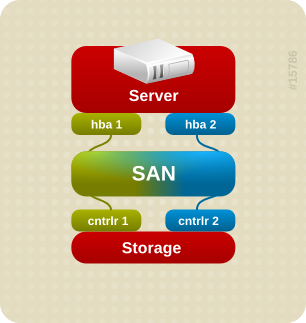 Multipathing in SAN is a technique of creating more than one physical path between the server and its storage devices. This technique uses redundant physical path components — adapters, cables, and switches — to create logical paths between the server and the storage device. In the event that one or more of these components fails (i.e. HBA failure or FC cable failure or SAN switch failure or Array controller port failure), causing the path to fail, multipathing logic uses an alternate path for I/O so that applications can still access their data. 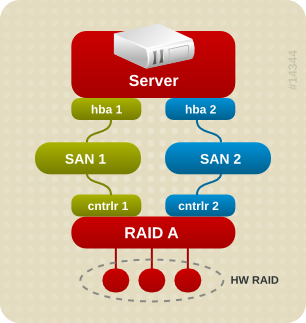 Each network interface card (in the iSCSI case) or HBA should be connected by using redundant switch infrastructures to provide continued access to storage in the event of a failure in a storage fabric component. The multipathing software handles all IO requests, passes them through the best possible path, and takes care of business if one of the paths dies. Using Multipathing automatic failover and recovery and Optimized load balancing can be implemented to ensure applications performance and availability. Active/Active mode: I/O can be spread among all paths. Active/Passive mode: I/O can be spread in half of total path. In Windows server, MPIO driver is required.